Nicario's compositions depict religious, historical and everyday events. His hands move quickly and with confidence to fashion people, animals, and mythical figurines as he creates poignant scenes from a doughy mixture of boiled potato and gypsum powder. For his sculpting process, Nicario's only tool is a small piece of wood resembling an enlarged toothpick. 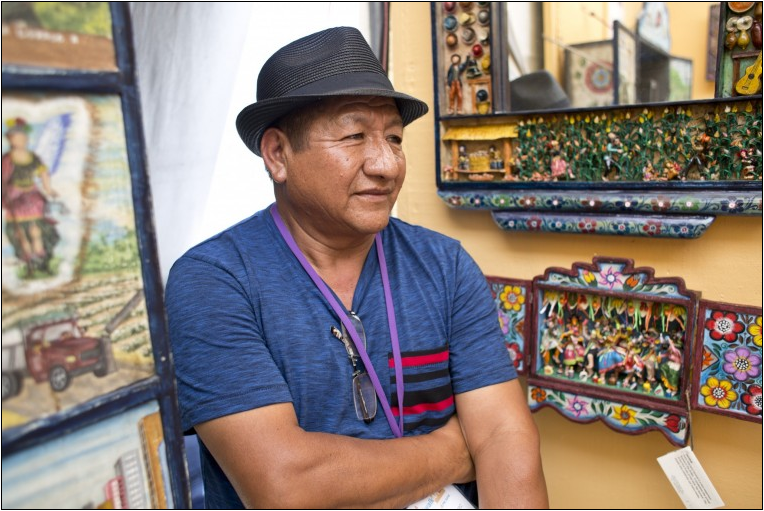 Born in a peasant community in the high Peruvian Andes, Nicario Jimenez studied sculpture at the Centro de Capacitacion Artesanal de Huamanaga and attended the Universidad Nacional San Cristobal de Huamanga in Ayacucho, Peru. His one person exhibitions include the San Francisco Craft and Folk Art Museum, the Cleveland Institute of Art, the Museum of Man in San Diego, California, the North Dakota Museum of Art, and the Rhode Island School of Design. College and American University. Jimenez's work is included in numerous prestigious public, corporate, and private collections. The artist now lives in Naples, Florida. ©Artist of the Andes. All right reserved.